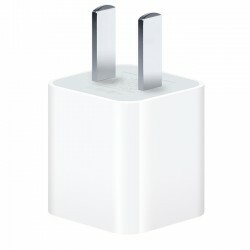 Earlier this year, a trio of computer scientists discovered a flaw in iOS 6 that would theoretically allow an iPhone or an iPad to be hacked using a "malicious USB charger." The researchers demonstrated the hack at the Black Hat Convention in Las Vegas today, showing off a custom built charger that was plugged into an iPhone. The charger, which took a week to design and cost just $45 in components, contained a small Linux computer programmed to launch an attack on iOS devices. According to a report from Reuters, the security flaw that could allow a fake charging station to potentially hack an iOS device has already been repaired in iOS 7. Apple said the issue had been fixed in the latest beta of iOS 7, which has already been released to software developers. "We would like to thank the researchers for their valuable input," Apple spokesman Tom Neumayr said. During the convention, the researchers successfully used the device they had constructed to hack into an iPhone, programming it to dial another phone. The group, worried that criminals might use the hack in malicious ways, publicized the issue in the spirit of "white hat" hacking. iOS 7, which is already in the hands of developers, is expected to be released to the general public this fall. Along with a fix for the charger hack, it also includes a number of new features like an overhauled Notification Center, a new Control Center, and a complete redesign. Apple continues to regularly release beta updates for the operating system, adding additional minor performance boosts and changes ahead of its official release. I'm curious to see a picture of this malicious charger. Yup people at Apple are really tying hard to get you back son. .....Apple said the issue had been fixed in the latest beta of iOS 7, which has already been released to software developers. APPLE took that really well, for a change. They haven't always been so gracious in the past. Perhaps the lack of blackmail was a factor. Nice! It's good to see security researchers pushing the limits to uncover any exploits and share them in the spirit of "white hat" hacking. After this and the news of Chinese chargers possibly electrocuting people, I wouldn't be surprised if people thought twice before buying that $2-$5 charger on amazon. I'm curious to see a picture of this malicious charger. Getting it small enough to be appealing would probably take some doing; AppleInsider has a pic if the mini-Linux-computer used, and small as it is, it's still just one component and is pretty big! You almost might as well disguise a Mac Mini as a charger. Actually they have often given public credit to those who have found flaws. Not everyone who finds a flaw deserves gracious treatment: some of them are after fame (or even malicious acts for pay) and don't care who gets hurt or hacked. Others handle the information responsibly. Think twice and then still buy them, because they work.